Do you want a detergent that delivers Brrrrilliant cleaning and colours in a cold wash? With Ariel's washing gel, you no longer need to choose between cleaning and care. Unlike washing powder this super concentrated detergent activates in cold water and dissolves rapidly even in a quick wash, removing stains and leaving your clothes clean and vibrant. 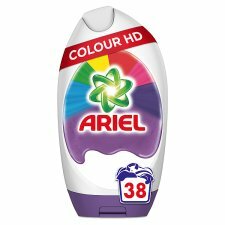 Ariel Colour & Style Gel also helps you keep your colours bright. Use together with Lenor fabric conditioners and Unstoppables, in wash scent booster, for an extra boost of softness and freshness. 38 washes based on 37ml per wash. Causes serious eye irritation. Harmful to aquatic life with long lasting effects. Keep out of reach of children. IF IN EYES: Rinse cautiously with water for several minutes. Remove contact lenses, if present and easy to do. Continue rinsing. If eye irritation persists: Get medical advice/attention. IF SWALLOWED: Call a POISON CENTRE/doctor if you feel unwell. If medical advice is needed, have product container or label at hand. Dispose of contents/container to an appropriate local waste system. Contains Isoeugenol. May produce an allergic reaction.